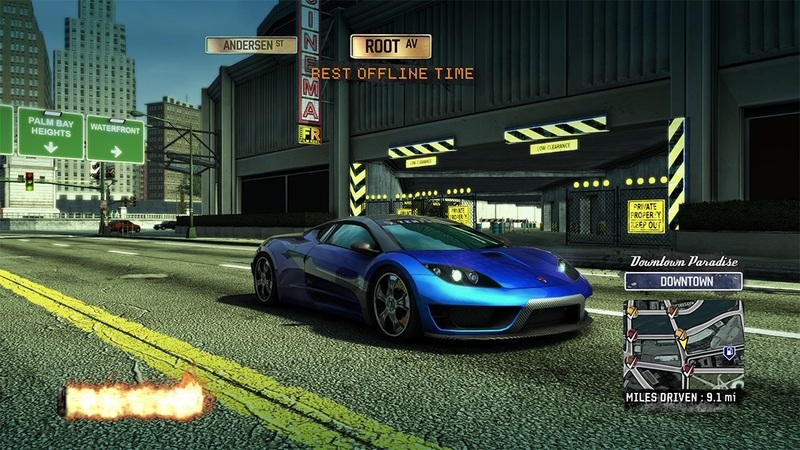 Back when Burnout Paradise was originally released in 2008, it was by far one of my favourite games at the time, and in fact has remained one of my all-time favourite games to this day. As a young kid, I loved crashes, and explosions, and fast cars, and explosions… I think you get the idea. And to be honest, not much has really changed 10 years later, as I still love all of those things and more. I remember Burnout Paradise giving me such a buzz of excitement when I was younger, it was a game that delivered a form of legal adrenaline rush that would leave you smiling for hours on end, thanks to brutally taking down numerous other cars. The high-octane energy you got from the game was immense, and few racing games manage to do that. However, nostalgia can often be a bit of a cruel curse, whilst in your head the memories may be amazing, most of the time when you go to revisit one of your favourite games, it can often backfire and leave you a bit disappointed. So, it was safe to say that when I found out I was heading back to Paradise City, I was a bit trepidatious. 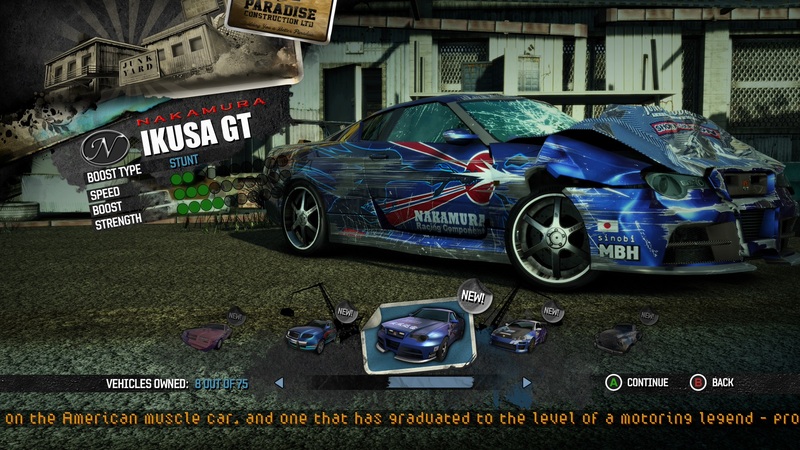 All of 75 cars from Burnout Paradise are back in the remsater for you to takedown and collect. But as soon as I got that first car from the junkyard, and fired up the engine, it was business as usual. Whilst I may have been nervous for a brief few seconds, all my worries were put straight to rest within moments as this game throws you straight into the action, just like it did 10 years ago. "As soon as I got that first car from the junkyard, and fired up the engine, it was business as usual." And this is something that the remaster of this game does very well, it is totally loyal to the original game. The biggest thing I remember about the game was the high-octane energy, fast-paced racing action, and I’m so happy to say that it’s all still here. Usually, when a game gets remastered, the publishing companies like to make small tweaks and adjustments to perhaps fine tune the game. Thankfully however, very little has been changed with this game in terms of the gameplay. None of the handling physics in this game have been touched in the slightest, or at least not that I can tell. All the vehicles still have their original liveries, the map is still the same, with the addition of the DLC Surf Island, it’s all there, and it’s all untouched. Although, I should stress that whilst the core mechanics of the game haven’t been changed in the slightest, the textures and framerate have been, boosting the original game's textures to 4K and alongside that comes a buttery-smooth 60fps too. I should also add here, that after playing this game for a good couple of hours, I haven’t noticed any framerate drops either, so I can happily say that the framerate for the remaster is solid. All of Paradise City has been updated to a crisp 4K resolution, and keeps its solid 60fps framerate. Another issue I picked up on was that multiplayer can be quite dull if it’s only yourself and another friend. It’s an online game that is meant to be played with full servers, and when there are only 2 to 3 people playing, the races, takedowns, and game modes can get very tedious and irritating. And being on the topic of multiplayer, it’s a shame to see that they didn’t decide to add more player space to the multiplayer lobbies as only an 8-player max lobby size does seems to be a tad outdated for an open world racing game. A personal issue I have, which isn’t a huge complaint but it’s something I would’ve liked to have seen in the remaster, would be some form of photo mode. I wouldn’t have wanted anything crazy, but as so games these days have some form of mode for you to take pictures in, it would’ve been a nice touch to have seen something like that introduced in the remaster. "Nostalgia can be a bit of a curse when it comes to playing old games again." But, now we move onto the biggest issue of them all, and weirdly, it’s not an issue that comes from 2008, but is in fact an issue that comes from 2018, and to put it simply, it’s the price. This game, whilst it does come with all new textures and all the DLC’s included, costs around £30 brand new. Now usually, I wouldn’t really have a huge issue with this, as most remasters are given a retail price like this because they are often remade from the ground up, but Burnout Paradise Remastered, it just feels like it’s just a very expensive 4K update on a 30-quid disc. And it bugs me, it really does, because unlike other remasters, Burnout Paradise has really remained loyal. They haven’t added any microtransactions to the game, they haven’t given the game some new grindy way to unlock all the vehicles, just for the sake of the feeling of pride and accomplishment, they have left the game completely and utterly pure. It really is the biggest insult to injury that the game has going for itself. Despite the lack of a photo mode, EA has provided us with some stunning pictures of the game. Burnout Paradise Remastered is a good game, do not get me wrong. This game has given me countless hours of joy and fun over the course of me reviewing it, and going back to what I said earlier, nostalgia can be a bit of a curse when it comes to playing old games again, like the graphics may not be as good as you remember, or perhaps the controls are a bit clunkier than you recall, but the Burnout Remaster suffers from none of this. Despite this game being 10 years old, it’s a breath of fresh air. So many racing games in recent years, have been no-where near as bonkers as this was. The genre of high-energy, fast-paced racing games seems to have died down a lot, and hopefully, thanks to remasters like this, we might see this genre come back, and hey you never know, we may even see the Burnout franchise comeback all together. But, overall, Burnout Paradise Remastered still remains a truly fantastic game. All of its original ridiculousness is still kept untouched, and if like me, you never played any of the DLC back when the original game came out, you may have a new little map to explore as well as a huge new vehicle roster to check out. And if perhaps that price tag is a bit too much for your liking, well, you could always get the 10-hour free trial on EA Access, just so you can fulfil that fast-paced, high-octane, racing buzz once again, and save yourself some cash. The remaster remains loyal to the original, however the price tag does seem a bit hefty. Tom is the co-founder and co-owner of FullThrottle Media. 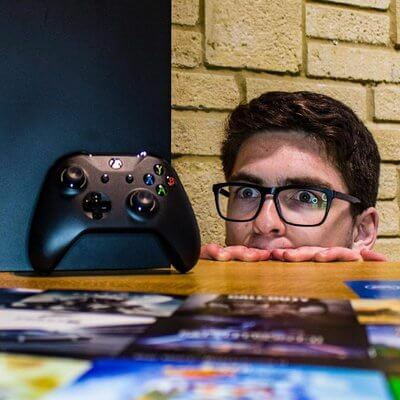 He's the face behind the iconic Gear Knobs series, which is recorded and edited in Rockstar’s Grand Theft Auto V. When it comes to Tom Matthews, two things come to mind – cars and Jeremy Clarkson, and you can expect to hear a lot of that amongst his various ramblings and rants in his weekly Sunday column.